In January, when David Bowie turned 65 (and yes, take a moment to think about that) the rock critic Alex Petridis wrote a piece arguing Bowie “didn’t really fit with the notion of the star in the 21st century”. Petridis’ point wasn’t that Bowie’s music hadn’t aged well; quite the opposite, in fact. Rather it was that Bowie’s enduring interest lies not in the man but the myth, a creation that has little meaning in a culture obsessed with access to the “real” person via Twitter and Tumblr and reality tv. This gap – between the public self we construct and the private self we preserve, or to put it in slightly different terms, between the illusion of access and true intimacy – is one of the various disjunctions explored in Dana Spiotta’s remarkable third novel, Stone Arabia, a book that manages not just to distill something essential out of the discontinuities of our media-saturated culture, but to speak eloquently to the far more familiar dilemmas of ageing and parenthood and loss. At the novel’s centre are two siblings, Denise and Nik. Now in her mid-40s, Denise’s life has been a failure in many ways. Brought up by her mother with only occasional visits from their charming but absent father, she got pregnant young with her daughter, Ada, bringing her up alone before falling into the role of carer (and chief banker) to Ada, Nik and their failing mother. But if Denise’s life has been a failure Nik’s has been something wholly stranger. Older than Denise by several years, he became obsessed with music in his teens, forming several bands which enjoyed enough success in the mid to late-1970s for the last, the appositely named The Fakes, to be offered a record deal. But when this deal went sour Nik elected to withdraw from the music scene, and concentrate not on public success but on writing and recording music privately. This is, of course, the trajectory of any number of young musicians, beautiful kids with guitars who burn briefly but not quite brightly enough. But for Nik merely writing music was not enough. Instead he began to engage in a process of what he describes as self-curation (“self-curate or disappear,” he advises Denise at one point, before deciding the better option might be to self-curate and disappear), inventing not just bands but an entire career, complete with fictional reviews and interviews, scandals and successes, all recorded and filed in a series of folders he keeps in his apartment and describes as his “Chronicles”. The life Nik creates in the Chronicles is both his and not-his: when his dog dies in real life Nik’s dog dies in the Chronicles, except there he gets a tribute album and “fans sent thousands of condolence cards”. Likewise in one of the books many brilliant but unsettling moments he ventriloquizes a letter from an imaginary Denise to an imaginary Ada, creating in the process a “witty, brutal parody” of the real Denise. These questions about authenticity, idealism and our capacity to mistake the dreams of youth for truth are not new ones for Spiotta, whose second novel, Eat the Document (which is also framed by a series of imaginary excursions into the ephemera of pop music) focuses on a former student radical who has taken on a new life and a new identity to escape the actions of the past. But in Stone Arabia they take on a new urgency. This is partly because of the manner in which the book’s cool, beautifully poised surfaces pull against the depth of feeling they contain. It’s tempting in this context to compare her to Joan Didion, a writer she resembles in more ways than one, except that Spiotta’s writing is more expansive, less obsessed with its own perfection. But it’s also a reflection of the distilled power and charge of Spiotta’s writing more generally. 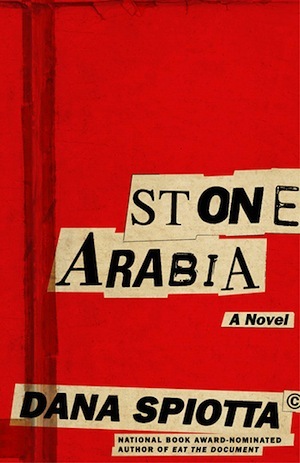 Perhaps appropriately for a book so concerned with the constructed nature of identity, Stone Arabia is a highly constructed piece of work, moving with deceptive ease between Denise’s own recollections, excerpts from the Chronicles and Ada’s blog. Yet despite that the book never feels contrived or over-determined, even when it prompts us to see the dilemmas of its characters as symptomatic of larger cultural phenomena. Indeed in many ways quite the reverse is true. For even as the book moves towards its gorgeously understated final pages (and the meaning of its somewhat gnomic title) it seems to find new depth and resonance, its many pieces coming into focus and allowing us to glimpse the way we often need to let go of our dreams to become ourselves. First published in The Weekend Australian 18 February 2012.